The Pitons Management Area consists of two lava domes or volcanic plugs that were made a WHS because of their volcanic history and aesthetic qualities. 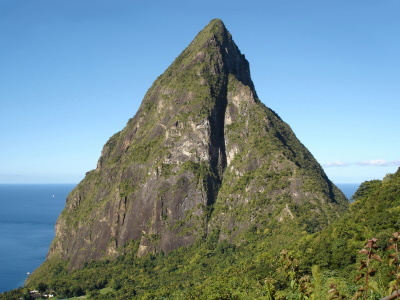 The Gros Piton is 771 m, and the Petit Piton is 743 m high; they are linked by the Piton Mitan ridge. The Pitons have various volcanic features, like sulphurous fumeroles, hot springs, explosion craters, pyroclastic deposits (pumice and ash), and lava flows. 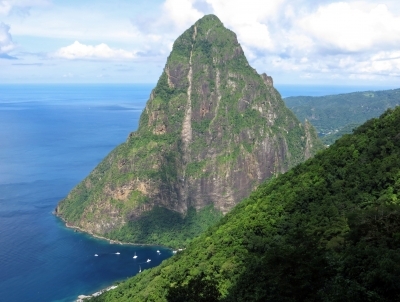 The Pitons of St. Lucia hold such a place of pride for the country that they are prominently featured on its flag. There was no way I was going to pass up a visit to the twin peaks when I traveled to St. Lucia in the fall of 2016, so I hired a driver from a tour company in the port of Castries to take me to the Pitons Management Area in the southern part of the island, near the town of Soufrière. Along the way I passed banana plantations, fishing villages, and scenic Marigot Bay, but I was most impressed when the Pitons first came into view along the coastline. Before visiting the peaks, my driver took me to the Sulphur Springs geothermal area, which was rather decent to visit, even though I have seen similar areas in other countries. Following Sulphur Springs, we drove to a farm on the Piton Mitan ridge, which connects Gros Piton with Petit Piton. There was a hike on the farm which gave me a spectacular view of the Pitons--particularly Petit Piton--set against the deep blue of the Caribbean. I thoroughly enjoyed the natural beauty of the peaks, and I have fond memories of that evening as I left the island, getting one last view of the Pitons silhouetted against the horizon as the sun set. Logistics: The Pitons Management Area is probably easiest to reach via private transportation. Staying in St Lucia for a week in July 2016 gave me gave me ample time for visiting the Pitons Management Area. I would recommend a boat excursion for a great view of the hills, and the bonus of being able to enjoy the reef and aquatic life that are included in the WHS inscription. Being an "inveterate WHS collector" this wasn't enough, though, so I also organised a guided ascent of Gros Piton. There is no real climbing required on the ascent of this, the larger of the two hills, but it was a steep walk all the way up. Fortunately the route is entirely shaded from the sun by tree canopy so we didn’t have to worry about sunburn. There is a great viewpoint about halfway up from which we got a different angle on Petit Piton. The view from the top is not as good as the one halfway up because it looks out onto the relatively flat southern end of Saint Lucia. Still, you definitely get a sense of achievement as you appreciate how far you have climbed. A large rock-mounted WHS logo is one of the better ones I’ve come across on my travels. It stands on the roadside on Petit Piton, overlooking Gros Piton. As a native St. Lucian, I have been to the Piton Management Area, and I find it exquisite, and the view after one has climbed Gros Piton makes me proud to be St. Lucian. I truly enjoyed the World's ONLY drive in volcano. I would encourage any body reading here to take a trip to St. Lucia to experience all that WE have to offer. It will truly be a rewarding experience. India Arie and Oprah defintely thought so ! It is unlikely, if you do go to St Lucia, that you would not go to see the Pitons (unless the beach is all you want!) – but equally they are not so special that you would be likely to go to St Lucia primarily in order to see them (unless perhaps you are a really inveterate WHS collector!). These volcanic plugs, rising c2000 ft straight from the sea, are certainly spectacular and the nearby town of Soufriere, with its slightly ramshackle wooden buildings and fine views of the Pitons, makes a pleasant outing in its own right. 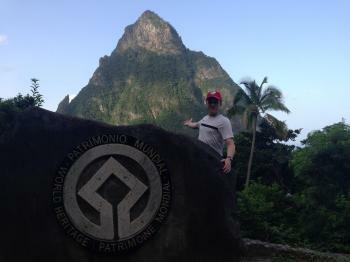 “Petit Piton” is in fact taller than (the “wider”) Gros Piton. The site is inscribed for its natural beauty (ni) as well as for its volcanic nature (niii) and it is possible to climb Petit Piton but this needs permission from the Forest + Lands Dept and a specialist guide ($45US). We did not do this (it is quite steep/precipitous apparently) although the site is supposed to contain a lot of wildlife including 5 St Lucia endemic bird species. Equally a large part of the site consists of the marine area and we cannot comment on the marine life/snorkelling etc. The Pitons Management Area includes Sulphur Springs – a volcanic area of bubbling mud pools and sulphur fumaroles which is all that remains of a volcano which collapsed 40000 years ago. On the same holiday we visited a similar, indeed apparently slightly less active, sight at Galway’s Soufriere on the island of Montserrat. A couple of years later it exploded in a major eruption which killed several people and led to the closure of the island for some years together with the, apparently permanent, evacuation of its southern part. So think of the underlying power which the bubbles portend! At the Springs guides may or may not be “compulsory” (depending on how adamant you are) to “assist” you to follow the paths and prevent you from straying onto the soft areas where indeed there have been accidents. We found this site a bit “tacky” – it claims to be “the world’s only drive in volcano” which perhaps tells you something. However we particularly liked the view of the Pitons themselves from the terrace of the up-market Dasheene Ladera boutique hotel/restaurant (not far from Sulphur Springs) where you can stop for a drink even if you are not staying. I quote :- “Attire for dinner is Island Elegant Casual”. As you sip your drink in peace amid the beautiful scenery it is perhaps not surprising that those not keyed into this aspect of St Lucia’s economy feel the need to do a bit of “hassling”! IUCN recommended "Deferral" solely under criterion i. It had been nominated under i and iii but IUCN considered that iii was not justified. The WHC went on to inscribe on both i and iii.